Home » Food and Nutrition » Can a Gluten Free Diet Benefit Those with Celiac Disease, ADHD and Autism? Gluten is a protein found in many grains such as rye, wheat and barley, and a gluten free diet benefits those who have celiac disease, a gluten intolerance, or a gluten sensitivity. Some schools of thought believe that autism might be linked to a gluten sensitivity as well. Understanding if you are truly sensitive or intolerant to gluten is important, because a gluten free diet is quite restrictive, can be unhealthy, and can even lead to weight gain because while you might eliminate some troublesome foods, what you end up substituting them with may be worse for you, in that they are highly processed or refined. Many gluten free food products try to imitate their gluten-containing counterparts, and are made of starchy items such as potato flour, corn flour, and tapioca flour—food sources that are low in vitamins and nutrients, and high in the wrong kinds of carbohydrates. Plus, if you don’t need to restrict gluten, you could be depriving yourself of essential nutrients from gluten-containing foods. So be wary when and if you are going gluten free. Essentially, a gluten free diet is an elimination diet; you eat gluten free foods to avoid the symptoms and side effects gluten has on your body. This diet, in which you remove bread, pasta, and grains, has exploded over the last few years, and even people who don’t have an intolerance or sensitivity to gluten are jumping on the bandwagon. This is potentially troubling, because a gluten free diet is not necessarily the most nutrient-dense diet. In fact, it can be quite lacking in nutrients because so many grains loaded with nutrients and vitamins are eliminated and not replaced with anything of equal value. As with many things diet-related, the gluten free idea is trendy and has been for quite a few years, but it is dipping in popularity because people are beginning to see that such a diet can lack essential nutrients. Unless there is a real need to adopt this diet, predominantly for sufferers of celiac disease, a gluten free diet (or a “celiac diet” in its truest definition) should be approached cautiously. Some doctors claim that a gluten free diet can have a variety of health benefits, such as improving cholesterol levels, promoting digestive health, and increasing energy levels, but the proviso here is whether you have a true gluten intolerance. Otherwise, there’s no point to eliminating those foods and you can just continue to eat a gluten diet. You don’t need to go “gluten free” to eat less bread; just eat bread in moderation and limit white bread to special occasions. Gluten is a protein found in grains, and it’s responsible for giving bread its elasticity; it gives bread a chewy consistency and prevents many baked goods from being sticky or doughy. Gluten free diets are mostly meant for people who suffer from celiac disease. A gluten free diet benefits celiac disease because it’s the gluten in grains that irritates the lining of the stomach, that is, the villi, of those with celiac. This irritation triggers an autoimmune response in which the body attacks the villi, damaging and destroying them. This causes intense discomfort, including stomach pain, gas, bloating, weight loss, decreased appetite, vomiting, and diarrhea, and ultimately this condition can lead to an inability to absorb nutrients through food. Removing gluten from the diet is the only way celiac sufferers can get reprieve. Some studies have also shown that going on a gluten free diet benefits the skin of those with celiac disease. Most naturopathic doctors will as a first step put children with autism on a gluten free diet because some research has been done saying it can improve symptoms and reduce outbursts. Anecdotal evidence indicates that this is true as well. Many children with autism suffer from gastrointestinal complaints, so this diet might help reduce the symptoms and their frequency, but there is no definitive proof or science to back the assertion that doing it will be beneficial. That said, there may be no harm in trying a 30-day elimination diet to see if there is a change in the child’s behavior, though it’s possible that that timeframe may be too short to observe changes (it might take a year before you notice anything substantial), so it’s best to talk to your doctor first. The gluten free diet benefits for ADHD sufferers may be similar to the benefits for those with autism. A study done in 2011 published in the journal Primary Care Companion for CNS Disorders found that about one in six ADHD test subjects also had celiac disease. Participants followed a gluten free diet for six months; the patients with celiac disease showed significant decreases in ADHD symptoms. The results show that there might be a connection, and that celiac is something doctors should be looking for as a possible symptom of ADHD, but because of the small sample size (only 67 people), further research is needed. There are other recommended diets for ADHD, such as the Feingold diet, ketogenic diets (high fat, low carb), elimination diets (also commonly used for allergies), or diets that increase the consumption of a particular nutrient/vitamin/mineral, but the results of these diets are mixed and medical experts are skeptical as to their efficacy. Another thing to consider is that the highly restrictive nature of these diets can also negatively affect the social lives of children with ADHD, as many of the restricted foods are those commonly available at parties and the like. If you do decide to go gluten free there are some benefits to enjoy from making this decision: a gluten free diet for weight loss is one. Below are a number of possible gluten free benefits to be had from choosing this diet. Some people find that switching to a diet that has no gluten or a limited of it simply makes them feel better, and whether or not there is an actual sensitivity is beside the point. Anecdotal evidence suggests that some people feel less bloated, have better bowel movements and less gas when they refrain from eating grains such as wheat and rye. Try a 30-day elimination diet and see if you notice any difference in how you feel. A sensitivity to gluten means you may not be digesting and absorbing vitamins and minerals properly. This can cause a drop in energy level, leaving you feeling tired. Many people with a gluten intolerance say that they feel weak and tired. How does a gluten free diet benefit weight loss? Most foods containing gluten have carbohydrates, and carbs are often the enemy of those on a diet, so by default a diet that removes gluten-rich foods—bread, pasta, pies, cakes, anything that uses a gluten flour—will also eliminate foods that are high in carbs, which can result in weight loss. Eating gluten free can help those who suffer from irritable bowel syndrome, a chronic gastrointestinal disorder. A diet low in fermentable oligosaccharides, disaccharides, monosaccharides, and polyols (also known as FODMAP) can help, and eating gluten free is a part of this. Gluten intolerance and sensitivity can create symptoms that mimic celiac disease, which makes celiac challenging to diagnose. Non-celiac gluten sensitivity is not the result of an autoimmune disorder and the problem is not genetic as it is for those with celiac disease. But nonetheless a sensitivity or intolerance can be uncomfortable and interfere with daily activities, so it’s worth having a conversation with your doctor to see if this is the case and if you should consider altering your diet. Unless a person has celiac disease, they will not suffer intestinal damage from ingesting gluten, but they can, however, have similar uncomfortable symptoms. As with many intolerances and sensitivities, those who don’t have celiac may experience symptoms long after ingesting items containing gluten (days in some cases), whereas someone with celiac disease will experience symptoms within hours or sooner. Without question, those who have celiac disease must follow a gluten free diet. Those who have an intolerance or sensitivity can also choose a gluten free diet, or they can try a diet that restricts gluten but doesn’t eliminate it entirely. Before dismissing every gluten-containing grain from your diet, try an elimination diet for 30 days first, one that removes all grains and then reintroduces one grain a time. Take note of how the grain makes you feel. If you feel bloated and uncomfortable or have other symptoms, then there’s a very good chance that you have an intolerance. 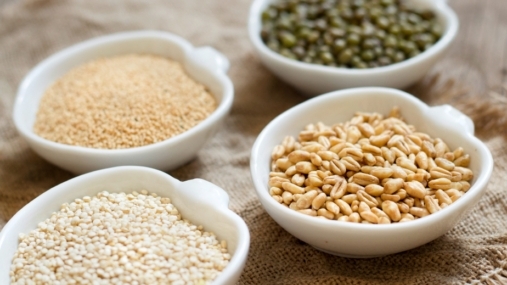 Work your way through the list and see which grains trigger which symptoms. Overall, if you don’t have celiac or an intolerance, then there’s not much point to avoiding grains, and in fact this diet may actually be detrimental to your health or lead to weight gain, since the items taking the place of grains are often high in sugar and carbohydrates. Remember: gluten free does not necessarily mean healthy. Below are lists of foods to eat and avoid while on a gluten free diet plan. You may find yourself with low energy; carbs are a necessary fuel for the body. Weight gain is a possibility as a result of the starches in replacement foods, namely potato, tapioca, and corn starch. Packaged gluten free foods may be loaded with sugars and not supplemented with vitamins and minerals as well. Malnutrition can happen as a result of food substitutions that have fewer nutrients and minerals than the foods that were removed. One of the biggest risks is that you might miss out on eating a more balanced, nutritious diet because a gluten free diet often cuts out many healthy foods. Packaged goods that are gluten free may lead some people to believe they are a free passes on treats; they may overindulge. A gluten free cookie is still a cookie. Be sure to read labels on gluten free packages, as there are potentially other ingredients that may trigger other sensitivities and intolerances. Also, many companies create gluten free products without taking the time to ensure that they are nutritious because they need to get to market fast, so becoming a label expert is important for this reason as well—you need to know what you’re putting in your body. Niederhofer, H., “Association of Attention-Deficit/Hyperactivity Disorder and Celiac Disease: A Brief Report,” Primary Care Companion for CNS Disorders, 2011; doi:10.4088/PCC.10br01104. “Health Benefits of a Gluten Free Diet,” Pritikin web site; https://www.pritikin.com/articles/health-benefits-gluten-free-diet/, last accessed April 8, 2016. “Gluten Free Diets: Benefits and Risks,” LiveScience web site; http://www.livescience.com/53061-gluten-free-diet-facts.html, last accessed April 8, 2016. “Gluten Free Diet,” Mayo Clinic web site; http://www.mayoclinic.org/healthy-lifestyle/nutrition-and-healthy-eating/in-depth/gluten-free-diet/art-20048530, last accessed April 8, 2016. “The Health Benefits of a Gluten Free Diet,” Bistro MD web site; http://www.bistromd.com/gluten-free/the-health-benefits-of-a-gluten-free-diet, last accessed April 8, 2016. “The Health Benefits of a Gluten Free Diet,” Prevention web site; http://www.prevention.com/food/healthy-eating-tips/benefits-and-downsides-gluten-free-eating, last accessed April 8, 2016. “5 Awesome Benefits of Going Gluten Free,” One Green Planet web site; http://www.onegreenplanet.org/natural-health/5-awesome-benefits-of-going-gluten-free, last accessed April 8, 2016. “What Are the Benefits of Eating Gluten Free?” Healthy Eating web site; http://healthyeating.sfgate.com/benefits-eating-glutenfree-6211.html , last accessed April 8, 2016. Nall, R., “The ADHD Diet: What Works, What Doesn’t,” Healthline web site, last reviewed February 29, 2016; http://www.healthline.com/health/adhd/adhd-diet#1, last accessed April 8, 2016.